Bomber (AKA Booster) ride for hire. 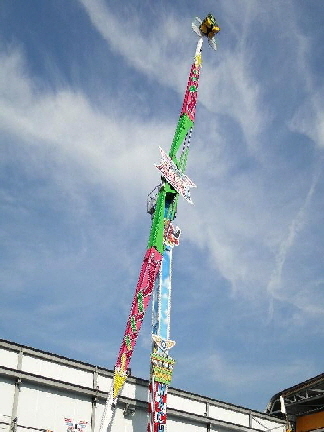 The Bomber is a high speed, high altitude, high adrenaline thrill ride! Eight brave riders are harnessed into their seats at each end of the arm and spun round at ludicrous speeds! As well as the arm spinning, the cars which hold the passengers are also free-flipping to add another terrifying dimension to the ride. The cars can also be held upside-down so riders feel that they are literally “bombing” into the ground! 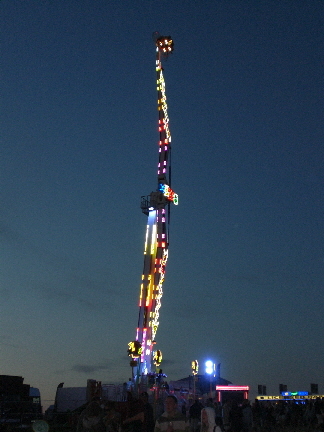 The sheer height of this attraction creates an instant landmark at each event it graces. Even those not brave enough to have a go themselves can’t help but stand back and watch the awesome spectacle of the Bomber ride in action! The bomber is very popular at music festivals, extreme sports events and anywhere that the WOW factor is required! If you would like to hire the Booster ride for your event, contact our helpful team for a no obligation quote and to find out more.